Probably the biggest challenge is finding Flat Cap Borough. For example, it’s not where Google Maps says it is, instead tucked away on the eastern side of Borough Market at the pointy end of the triangular arrangement of stalls known as Green Market, directly south of Southwark Cathedral. If you’re coming over London Bridge and down Borough High Street, just go under the railway lines and turn right into the pedestrian tunnel, which will bring you into the market, right by Flat Cap. If you’ve visited Flat Cap Victoria then all will seem very familiar. There’s a simple barrow, with an espresso machine (a lovely white La Marzocco FB80) on the left and the grinder (a Mythos 1) on the right, along with the till. There’s also a large umbrella, but since the barrow is actually under the railway tracks, you’re not too exposed to the elements. While I was there, Flat Cap had a very special guest barista, none other than Scott, edit of Caffeine Magazine. He had decided to put his money where his mouth was and work behind an espresso machine for a few days. However, rather than pick a nice, cosy coffee shop, he went for the Flat Cap barrow. In January. You can’t get more hard-core than that, so hats off to Scott. If you’re interested, you can read all about his adventures in the current issue. Naturally I couldn’t miss the chance to get Scott to make my coffee, which is what lured me down there in the first place. Of course, he’s long gone now and instead, you’ll get a warm welcome from Lukas, Mike and the rest of the team. 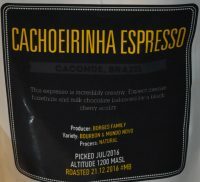 The coffee is always a single-origin from Notes, which changes on a regular basis, so the Brazilian Cachoeirinha which I had will also be long gone. My flat white was lovely, so hats off (a second time) to Scott. The milk was beautifully steamed, rich and creamy, resulting in a very smooth, well-rounded drink, milk and coffee complimenting each other perfectly. You can also see what I made of the same coffee when I tried it as an espresso at Silhouette on Cheapside. If you ever find yourself down at Borough Market, then make a beeline for Flat Cap Borough for a warm welcome and some excellent coffee. Don’t forget to bring your own cup though: Flat Cap Borough only has disposables. This entry was posted in Coffee Carts/Stalls, Food Halls/Markets, Retailers, Saturday Short, South East London, Stations Nearby, Takeaway and tagged include, Notes by Brian Williams. Bookmark the permalink.